* 2013 event date set for Sunday, Oct. 27 (inclement weather date Nov. 3). Registration opens June 1. 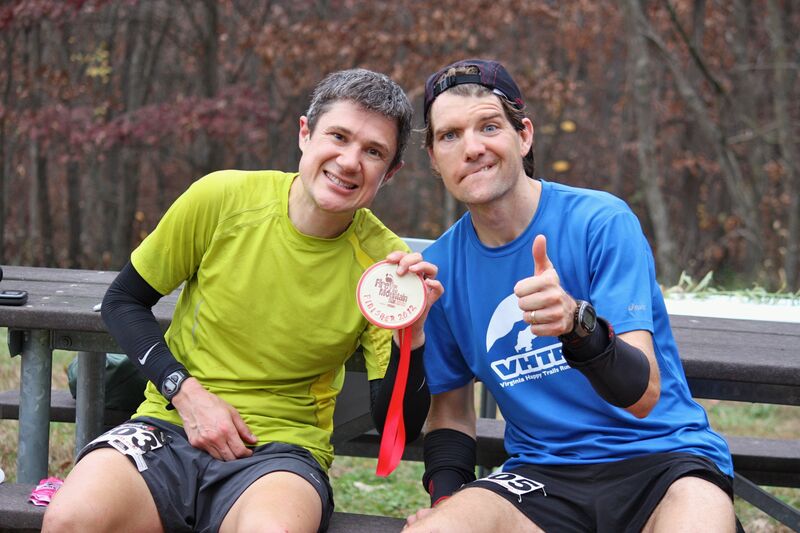 Canadian Adam Hill, left, and Brad Hinton, of Virginia, pose together at the finish line on Sunday of the 3rd annual Fire on the Mountain 50K (pres. by Sheetz). Hinton set a course record, besting the previous standard by more than 11 minutes. FLINTSTONE, Md., Oct. 28, 2012 — Brad Hinton, 36, of Stephens City, Va., shattered the Fire on the Mountain 50K (pres. by Sheetz) course record by more than 11 minutes from the previous best. Hinton outlasted Canadian Adam Hill, 36, of Orellia, Ontario, to win the 3rd annual point-to-point trail race in Green Ridge State Forest in 4 hours, 38 minutes and 7.1 seconds. Hill placed a close second in 4:38:49.2.The 42-second difference is the closest margin of victory for the top two male finishers in the history of the race. The route is divided into four sections — red trail, green trail, logging roads and purple trail. Hinton said he used the speed of the forest service roads — and especially the three-mile-long downhill section — to catch pull ahead of Hill. The two had entered the halfway point at Aid Station 4 at Log Roll Overlook together. In the women’s race, Bedford, Pa., resident Michelle Roy carved more than 50 minutes off last year’s performance to win the women’s title in 6:13:05.2. She placed 24th overall — a significant improvement over her 2011 effort in which she placed 29th in 7:05:25. Michelle Roy got to Aid Station 4, a.k.a. “the oasis,” in about 3 hours and 6 minutes. She ran the second half of the race in about the same time for the overall win. 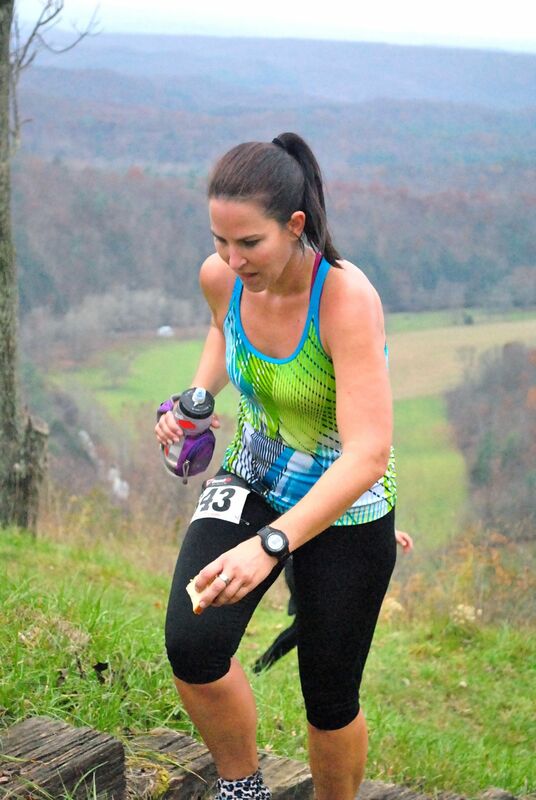 Joanne Van Horn, 47, of Douglassville, Pa., established a new standard for women over 40 with a time of 6:23:54.3. The previous best was 6:25:20 by Selena Smart). The duet of Karyn Dulaney, of Westminster, Md., and Jennifer Ford, of Shelton, Wash., earned the top spot among eight relay teams with a time of 5:28:37.2. The time set an event relay record, more than three minutes ahead of the 5:31:58.7 that won last year (Charlie Falter and Danny Welsch). A huge thanks to the countless volunteers on the course today, including: Jill, Troy, Patrick, Fin, Heather, Noah, Hal, Kirke, Lindsay, Stephanie, John, Keith, Sophia, Nick, Mike, Karyn and Christine. If I missed anyone, please don’t hesitate to send friendly email and let me know who and what capacity they helped. I do try to meet everyone, but in events like this help pops up from everywhere and, sometimes, I don’t even know it. That’s what makes putting on an event like this pretty great.